The waterfront along Amsterdam North is a vast industrial area that was once the city’s largest shipyard. Known as NDSM (aka "City of the Arts"), the area is now full of large warehouses and open spaces that have been transformed into experimental projects and shelters. 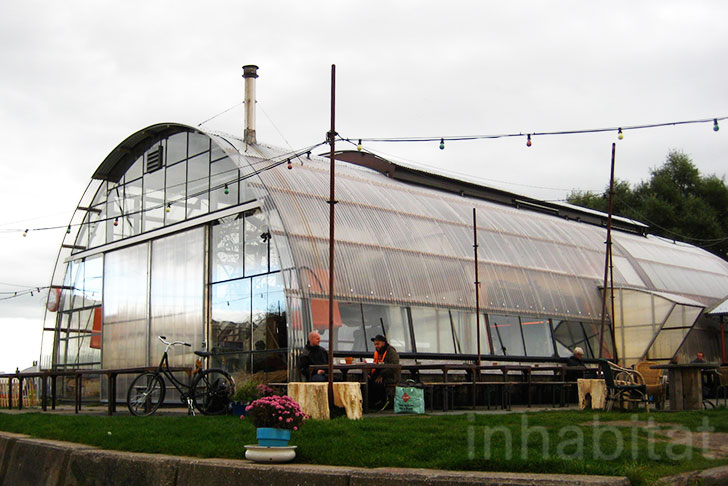 Within its grounds, the brilliant Noorderlicht (Aurora Borealis), which is housed in a former greenhouse, serves as a meeting place for creatives working in the area and offers a wide variety of tasty organic seasonal dishes. Artists, squatters and skaters started NDSM during the 1990s after the Dutch Dock and Shipbuilding Company went bankrupt in 1984. It’s very easy to get to the area, as it only takes a short (free) ferry ride from behind “A’dam” Centraal Station. The Noorderlicht cafe is just a few minutes walk from where the ferry terminal, and it is easy to spot as it’s shaped like a crystalline hangar and made from transparent materials. Built with durable see-through polycarbonate and glass, the café gets plenty of natural light inside. The tables outside are great for enjoying a coffee or a healthy meal (when the weather allows it). 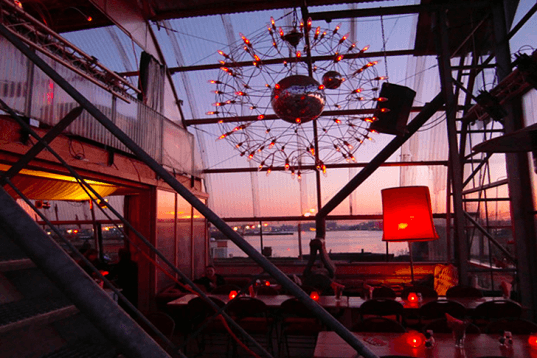 And during summer nights, the café is known for throwing great parties overlooking the city center across the IJ. While the gardens are filled with recycled driftwood, metal and glass sculptures, the interiors are comfortable and warm. The ground floor is filled with tables and small living areas and the top floor is for playing pool or small intimate gigs. Filled with vintage objects, one of the café’s walls is made from piled sandbags that serve to insulate the space. Bright and wooden, the Noorderlicht’s interiors are cozy and the atmosphere is friendly. There is a great deal of no-frills organic seasonal food on offer. But a good option is to order their trademark dish: the Dutch Weed Burger, which is made from seasonal vegetables and seaweed. Whether is the dissociation from the main part of the city or the fact that the area was built in a grand neglected space, the feeling is that anything is possible at NDSM. Artists, squatters and skaters started NDSM during the nineties after the Dutch Dock and Shipbuilding Company went bankrupt in 1984. It is very easy to get to the area, it only takes a short – free -- ferry ride from behind “A'dam” Centraal Station. The Noorderlicht cafe is just a few minutes walk from where the ferry lands and it is easy to spot as it’s shaped like a crystalline hangar and made from transparent materials. 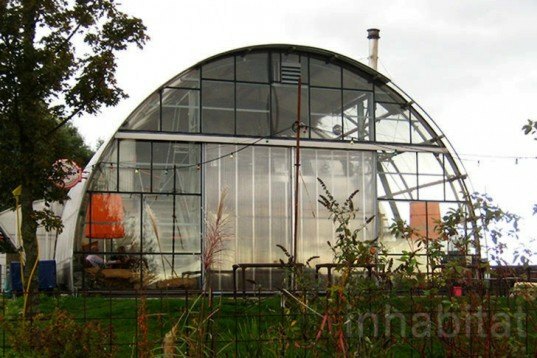 Built with durable see-through polycarbonate and glass, the café gets plenty of natural light inside. The tables outside are great for enjoying a coffee or a healthy meal (when the weather allows it). And during summer nights, the café is well known for throwing great parties overlooking the mad city’s center across the IJ. While the gardens are filled with recycled driftwood, metal and glass sculptures, the interiors are comfortable and warm. The ground floor is filled with tables and small living areas and the top floor is for playing pool or small intimate gigs. Filled with vintage objects, one of the café’s wall is made from pilled sandbags that serve as ready-made insulation. Bright and wooden, the Noorderlicht's interiors are cozy and the atmosphere is friendly. There is a great deal of no-frills organic seasonal food on offer. But a good option will be to order their trademark dish: the Dutch Weed Burger… made from seasonal vegetables and seaweed.